Situated between mainland and island-defined archaeological entities, Attica has traditionally been treated as a transitional borderland between what is perceived as ‘Helladic’ versus ‘Cycladic’ culture. Most discussions of social and cultural interactions in the southern Aegean have so far assumed a peripheral role for Attica during the Final Neolithic (4100-3100 BC) and the Early Bronze Age (3100-2000 BC). This is mainly an accident of investigation, due to the lack of systematic research focusing on the stylistic character of FN-EBA material culture excavated at sites within this region. Among the archaeological evidence from Attica, pottery is the most abundant artefact type and its presence at all the excavated sites provides considerable research potential for detailed inter-site comparisons. 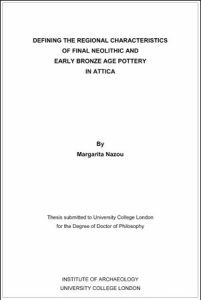 This thesis systematically describes, summarises and presents a large body of FN-EB II pottery from Attica. Two as yet unpublished ceramic assemblages in southeastern Attica provide the principal case studies: Kontra Gliate (also known as Kiapha Thiti) and Mine 3 at Thorikos. The stylistic characteristics and variation within and between these ceramic assemblages are defined in terms of time and space, and the relationships between fabrics, forms and surface treatments are explored. In addition, smaller assemblages of pottery from other FN-EB II sites in Attica and the surrounding islands were studied with the same methodology, for the first time allowing detailed comparisons: the Agora of Athens, the Kitsos Cave, Thorikos Velatouri, Plakari on Euboea, Kephala on Kea and Kolonna on Aegina. The analysis explores Attica’s stylistic connections with neighbouring areas, i.e. Boeotia, Euboea, the Cyclades, the Saronic Gulf and the northeastern Peloponnese, and defines site-specific and regional variants of FN-EB II pottery styles. 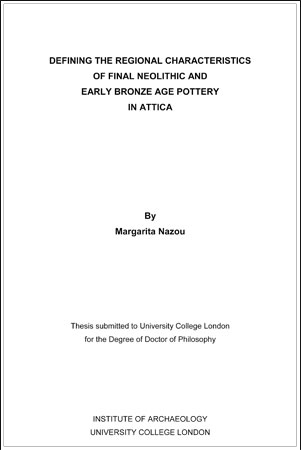 The thesis concludes by suggesting an interpretation of the patterns of pottery production and consumption in Attica during the FN-EB II periods.